Tempeh is one of the most rewarding things to make at home. I can truly say this now after several years of regularly making it. The initial method that I used, which I blogged about in 2012, were the directions from the shop where I get the rhizopus mould or tempeh starter from. Over the years, through the experience that I have gained, I have been able to improve the process into a much less laborious one with equally satisfying results. First thing is to get good quality organic and non-gmo soybeans. I buy mine in bulk at the health store. You can also get them online if it makes life easier. Good quality soybeans not only means it is better for your body but it also cooks better and tastes more creamy. Watch the explicit video below for the easy procedure on how to make tempeh at home. The written and printable instructions are below. No dehulling of the soybeans. If you don’t have a grain mill, after soaking the whole beans overnight, the original method instructs to dehull the beans by hand. This is done by massaging them into the water until the hulls would float up. Then pour them out and keep doing this until most of the beans are dehulled. But this is very time consuming and as it turns out, a rather unnecessary process as I’ve made successful tempeh even without dehulling the beans. In fact, what I have noticed is that the dehulled beans take a whole lot longer to boil and they do not become as soft and smooth as when they are boiled with their hulls on. Cooking the beans to be how you like them. I like to cook the beans until they are soft but not mushy. The previous instructions I used to follow would get the beans to remain at a crunchy consistency. I figured since I am making my own tempeh, I might as well make it the way I like it. So, I cook the beans to the softness that I would usually consume them. This results in a smooth and creamy texture; something that you will not get with store-bought tempeh. Adding vinegar at the last stage of cooking. When vinegar is added at the beginning, I’ve noticed that the beans take far longer to cook. The acidity considerably slows down the cooking process. I guess if you are using a pressure cooker, you can add the vinegar right at the start. But if you are using a pot like I do, then I find it to be a lot more efficient to only add the vinegar at the last stage of cooking. Not adding the vinegar at the start does result in a slightly different tasting tempeh. The fermented taste is less pronounced but I do not mind this at all as once the tempeh is seasoned and cooked, this is barely noticeable. The vinegar is needed to provide a slightly acidic environment that favours the growth of the mould. It also adds to the characteristic nutty mushroom flavour of the resulting tempeh. Where to buy the Rhizopus mould (tempeh starter)? I really recommend buying the mould from here. This is from where I buy mine and I have always gotten excellent white tempeh with no black spots. They ship internationally. Else you can also find it on Amazon for Canada and the US. If you plan on making soy-free tempeh, you may want to get the soy-free tempeh starter in Canada from here and the US from here. Feed the bean soaking water to the plants. Keep this water that the beans have been soaking in overnight and feed it to the plants. This water is not good for us but it’s a good source of nutrients for the plants. This is better used for outdoor plants rather than indoor ones as the liquid might smell after a day or so. Alternative to plastic bags for the fermentation process. 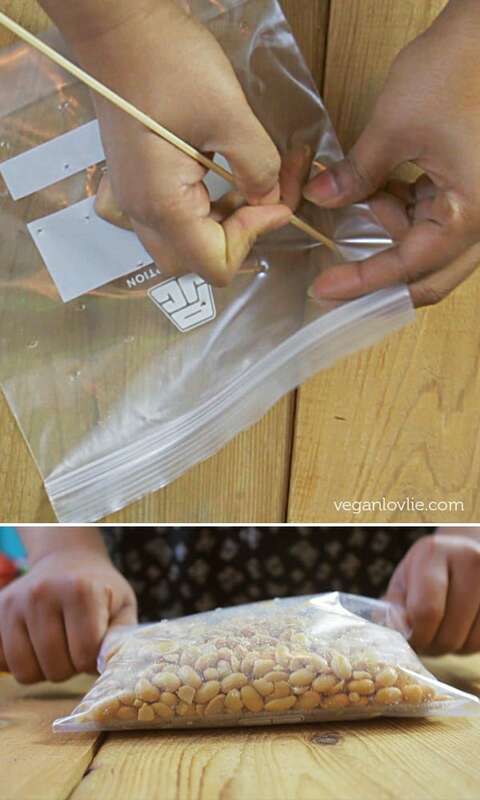 I have been using plastic zip lock bags that I usually perforate at about an inch interval all over the bag with a bamboo or metal skewer. However, I can now find frozen banana leaves at my local Asian store. 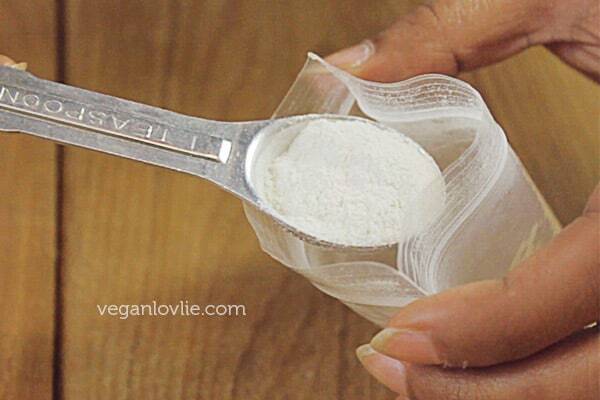 So, they make a great alternative to using plastic. Banana leaves are porous and do not need any perforations. What I have also found to work is to just place the beans in a glass or ceramic dish. Then place the dish uncovered in a closed large box. I have one of those cake boxes with a lid that seem to work great for that purpose. Otherwise, you can just use any large plastic box. You need to keep the lid on though except when you are checking on the tempeh. The spores tend to go a little out of control with this method though. Also, the resulting tempeh is a little less compact and drier than when using a bag or wrapped leaf. But the tempeh cake still holds together well. Make sure to thoroughly wash the box afterward to clean it of all remaining spores. Alternative to using an incubator. I have actually never used an incubator when making tempeh. I either leave the bags or wrapped leaf sandwiched between two board close to a radiator or I keep them in the oven with only the light turn on for about 12 hours. After 12 hours, the beans should start to generate their own heat from the fermentation. Then, they can be removed and placed outside in a warm place. You can cover the boards with a tea towel. Apart from soybeans, tempeh can also be made with other beans, legumes, grains, or a mixture of these along with some seeds added in for extra nutrients, taste and texture. If you make soymilk or tofu at home, a good way to use up the okara, that is the leftover soy pulp, is to make tempeh with it. This works out to be very economical. 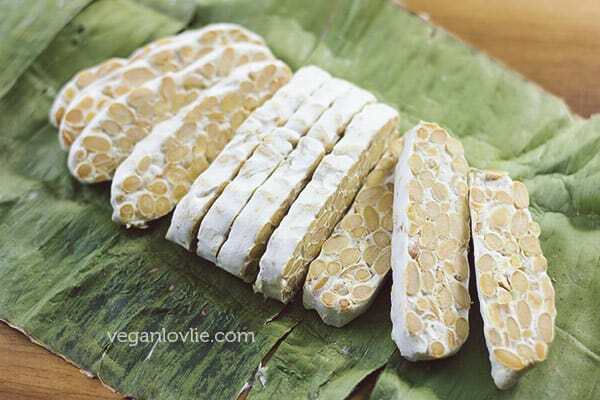 In fact, this is how tempeh was discovered in Java, Indonesia, during the production of tofu. The discarded soybean pulp caught the spores and grew around the pulp. It was found to be edible and tempeh was born. If using okara, you would just add a quarter of the amount of vinegar to the pulp and warm it up to about 35°Celsius (or 95°Fahrenheit). Then mix in the mould and proceed as for the rest of the recipe. 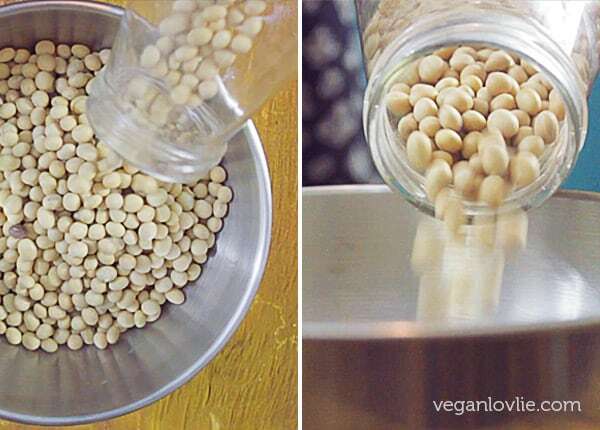 Chickpeas along with lentils and other legumes make great soy-free options for tempeh. The procedure is pretty much the same for these. 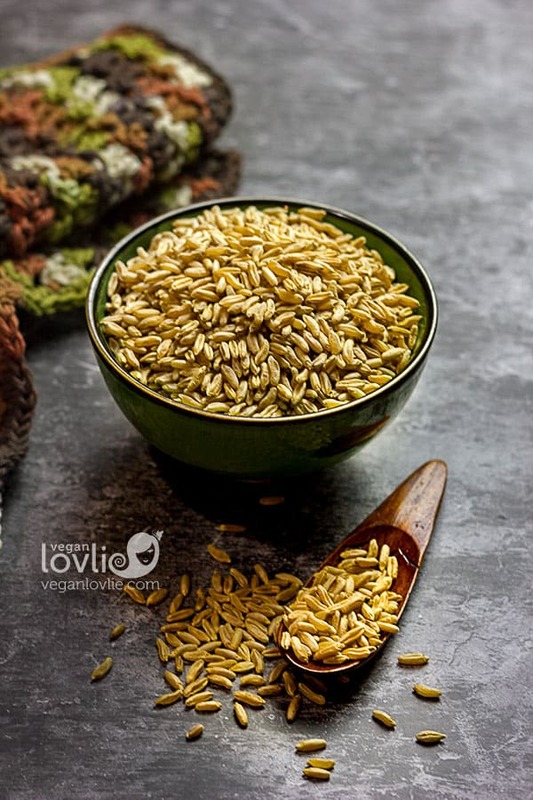 Other variations that I have not personally tried make us of seeds like sunflower or sesame seeds (to which I am allergic) and rice combined with the soybeans. Apparently, adding brown rice with the soybeans, produces a somewhat alcoholic tempeh from the fermentation. I haven’t given this a try; I am not sure about a boozy tempeh! But some might like it. If you have attempted the mixed rice tempeh, I would love to know what you thought of the taste. 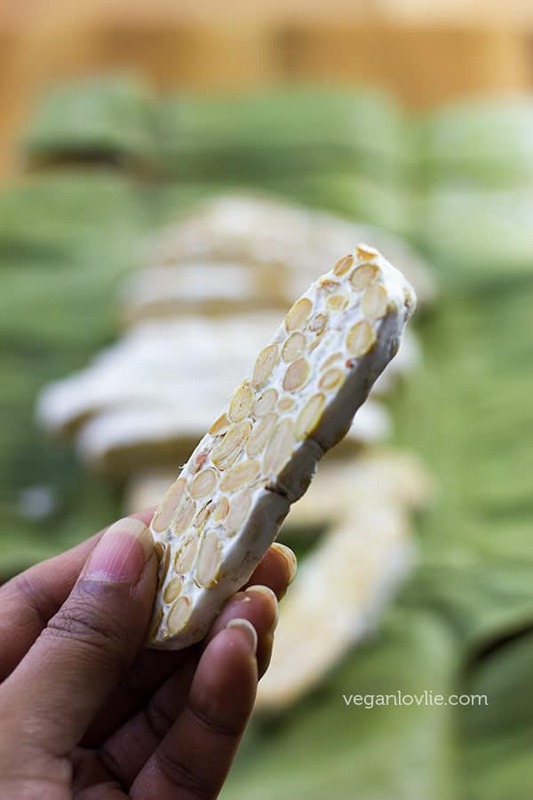 Apart from protein and fibre present in soybeans, tempeh offers a much more nutritious and digestible way to eat soy if you are not intolerant or allergic. The fermentation process reduces the phytic acid in the soy and this allows the body to better absorb the minerals. The gas causing substances are also considerably reduced by the rhizopus mould. 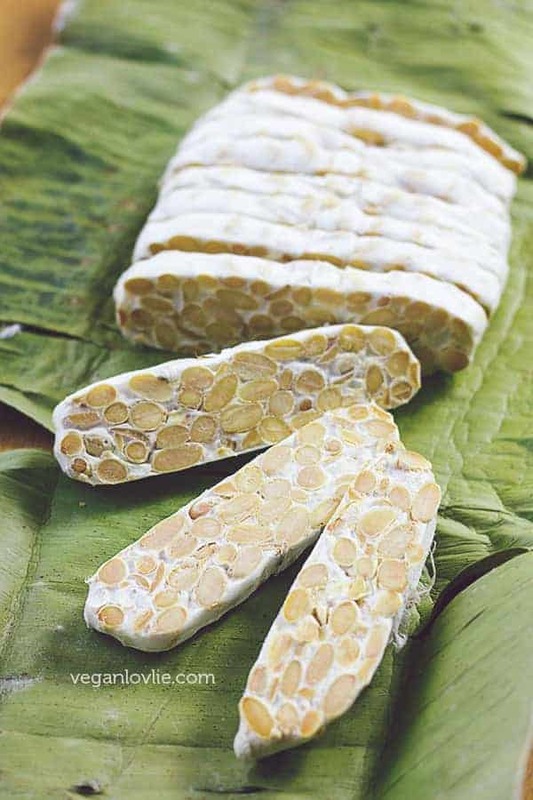 There may also be some vitamin B12 present in tempeh (according to Wikipedia), although it is quite hard to determine the quantity as this greatly vary with the starter culture itself and the environment. Overall, tempeh offers a much more nutritious and digestible way to eat soy. Soak the beans overnight or for at least 8 hours. Then drain the water. (You may keep this water and feed it to the plants). Rinse the beans a couple of times with fresh water then place them in a large pot and fill with fresh water to cover them so that the water level comes to about an inch above the beans. Cover and cook on medium heat. Keep an eye on the pot and if the water starts to boil over, place the lid at a slight angle to let more of the steam escape. Then lower the heat. Once the excess steam has gone down, you can cover the pot again. Check for the water level every now and then. Check the beans for doneness as from 30 minutes. Add more water if needed to cook the beans for longer. Soybeans may take from 30 minutes to one hour to cook. Cook the beans until they are almost done or to about 80% done. Then add in the vinegar. Continue to cook the beans until they are soft but not mushy. Once the beans are cooked, drain almost all of the water. Once drained, return the beans onto the heat and evaporate the remaining liquid from the pot. Make sure not to dry out the beans but all the liquid should be gone. Allow the beans to cool to about 35°Celsius (or 95°Fahrenheit). Then add the rhizopus mould to the beans and mix well. Perforate the bag at one inch interval all over. Divide the beans in the portion size that you wish and fill them into perforated plastic zip lock bags. Close the bag and fold if necessary to reduce the size so that you get a nice thickness for the beans. Distribute the beans evenly. Cut the leaf to the required size (note: leave the stem of the leaf attach; this will prevent the leaf from being torn). 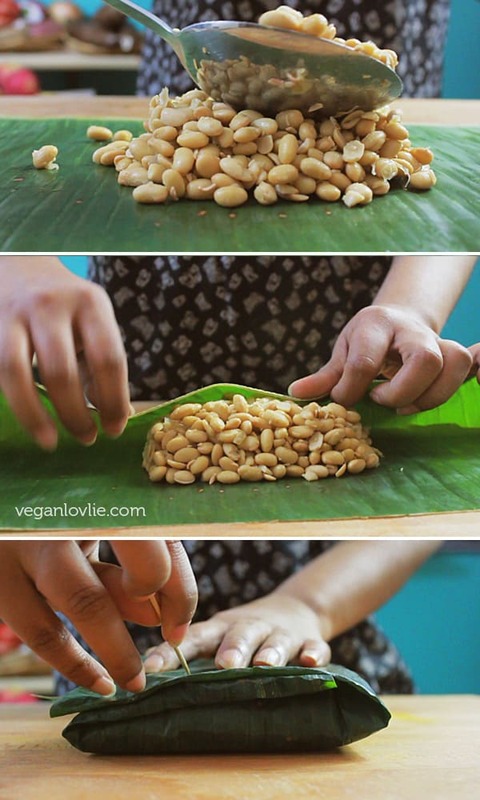 Place a portion of beans on the leaf and fold the ends over to enclose them. Secure with a toothpick. 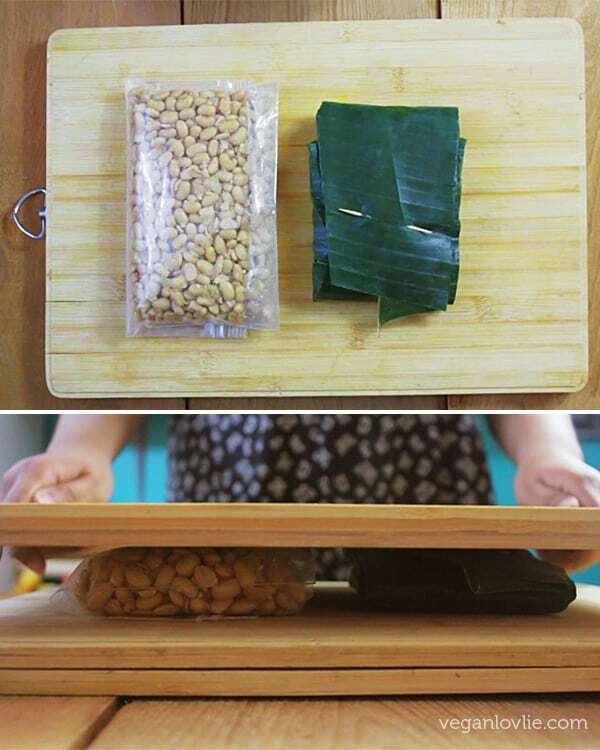 Place the bags or wrapped leaves in between two chopping board and keep in a warm place. You may place them in an incubator or in the oven with only the lights turn on for 12 hours. After 12 hours, remove from the incubator or oven and keep in a warm place for the rest of the fermentation. Get the dish and a large plastic box ready. 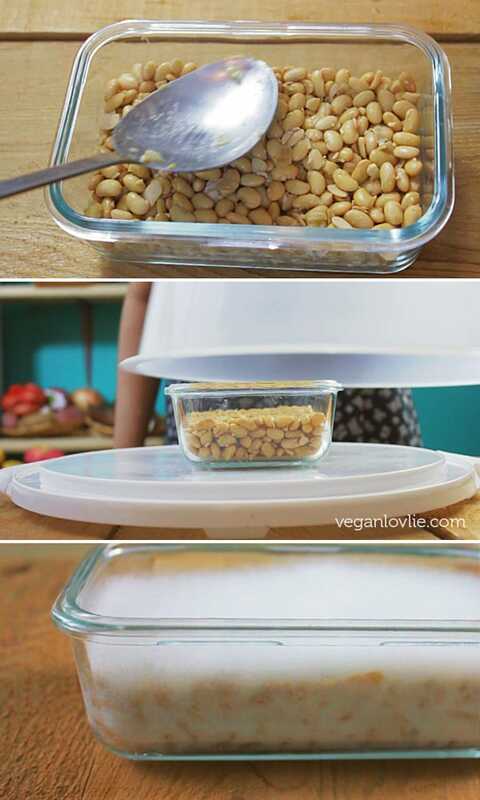 Place the beans in the dish and level them out. Place the dish uncovered inside the plastic box and keep closed in a warm place for 36 – 48 hours. After 36 to 48 hours (in either of these methods), the spores should be fully grown and the tempeh is ready. Cut and divide into smaller portions if you wish for storage. Tempeh will keep for a week in the refrigerator or for several months in the freezer. I freeze mine for up to 6 months. Tempeh has to be properly cooked before consuming. It can be steamed or boiled, marinated and pan fried or used according to your favourite recipes. An easy method on how to make tempeh at home. Rinse the beans a couple of times with fresh water then place them in a large pot and fill with fresh water to cover them so that the water level comes to about an inch above the beans. Cover and cook on medium heat. Perforate the bag at one inch interval all over. Divide the beans in the portion size that you wish and fill them into perforated plastic zip lock bags. Close the bag and fold if necessary to reduce the size so that you get a nice thickness for the beans. Distribute the beans evenly. I really recommend buying the mould from them. This is from where I buy mine and I have always gotten excellent white tempeh with no black spots. They ship internationally. I have read that you should steam the tempeh before freezing – do you do this, or do you freeze it raw? I also end up with a lot of okara after making soy or bean milk and bake it to use as crumbles, but that destroys some of whatever nutrition is left. Soybeans are safer to use after being fermented anyway. I look forward to your feedback about how to make tempeh using okara. I haven’t tried to make any kind of tempeh yet because the Indonesian blend of cultures recommended by another source has been hard to find. can you add any salt or seasoning before the fermentation? No, anything other than the vinegar and the mould might interfere with the fermentation and prevent the mould to grow. My first attempt, following your instructions exactly (except I used rice vinegar) didn’t work. I made a video of my results, if you see this then could you give me an email to send you the video and maybe you could advise me on what I did wrong? It’s winter here and I keep the house cold, so I left the beans in the oven for 36 hours with the light on. Thanks for getting in touch James. I replied on YouTube comments but since I’ve been asked this question a few times, I’ll paste the answer below for others too. 🙂 I hope you’ll try again and have successful tempeh next time. Place the bags or wrapped leaves in between two chopping boards and keep in a warm place. You may place them in an incubator or in the oven with only the lights turn on for 12 hours. If you left them in the oven with the light on for 36 hours, it is far too long to leave them at this temperature. The reason being, after 12 hours, the beans should be generating their own heat from the active mould. So, you just need a warm place (I’d say around 23 – 27 degrees Celsius) to keep them. If your house is cold, then you will have to somehow find a warm place to keep them but not as warm as with the oven light as after 12 hours, condensation will start to form in the bags. And this mould won’t grow in excess humidity. You might get away with banana leaves because the oven light will dry out the leaves and the excess moisture inside will be drawn out through the porous leaves. So if you used plastic bags, then you definitely have to remove them from the oven after 12 hours like the instruction says. Sometimes it may take more than 36 hours for the beans to ferment, up to 3 days maximum is safe if the beans don’t smell bad. Every time I make tempeh, I always go back to your video! It’s so simple and easy and follow. Today I tried making it, and found out I no longer had any tempeh starter culture so I was left with all these already soaked and cooked soybeans. I have now packed them up in my freezer hoping I can salvage it for next time I have the opportunity to make tempeh. Do think those soybeans will still work in making tempeh? Thanks a lot for your yummy recipes! I think the beans should still be good to use once defrosted and dried in a pan. The important thing is to get the beans to be really dry (and cooled down) before adding the starter. Regarding the okara tempeh, is that using raw soya bean pulp, or is your okara cooked as part of your particular soya milk recipe, as okara can be created before or after cooking the soya milk. Have you ever tried getting the culture from previous batches of tempeh rather than the bought culture? Could I have some help with doubling the recipe? I usually make tempeh using 4 cups of dry beans. For some reason when attempting this recipe it turns out brownish with only a few spots of mold. Only have made it using a boxed starter in the store before now but those can be expensive. Doubling the recipe should work fine by just doubling the starter and vinegar. It may be that you are not drying the beans enough before adding the starting. Moisture (including condensation if the beans are too warm) is the main reason that prevents proper fermentation. I think my first attempt has failed because the environment was too warm… I took the beans out of the warm oven (24 hours in there!) and have re-placed them in a different room. I also added more tempeh culture/starter. let’s see how it goes, but I’m hoping this will kick-start a fermentation process…. Hi Alexandra, the important thing is to get the beans as dry as possible before adding the culture as it doesn’t like moisture. So, if you leave the tempeh in the oven for too long, condensation will start to form. And this is one of the main reasons why fermentation does not occur properly. So, make sure you don’t get any condensation when you are placing the beans in the bags. If you do, take them out and leave them to cool a little bit more. 12 hours in the oven is enough to get the culture to generate its own heat. Then remove the tempeh from the oven and let them somewhere in the room where there is some ventilation (although not cold air or drafts). I hope this helps. Let me know how your second batch turns out. I’m Indonesian currently in Australia. It’s my 1st time making my own tempeh and i successfully made it. Very happy indeed ?. Thank you very much for the recipe. Okara tempeh! Why haven’t I thought of this before? I actually avoid making tofu because I hate using up the Okara. I have been planning to make Tofu or Tempeh this weekend, now I will make both! Thank you for the inspiration. Is it possible to make tempeh with store-bought tempeh as a starter? Is the mold alive and is going to grow? And when I make my own tempeh is it possible to use mold from the last batch or do I have to buy new mold every time? You can use the tempeh from a previous batch to make a new batch but if then don’t let the first batch ferment completely (just half-way through or about 12 hours). Otherwise when it is mixed with the second batch, the tempeh from the 1st batch will be fermenting for too long and may go off. So, the timing has to be right for this to work. I hope this helps. Hello~ I’ve been searching around for an alternative to using plastic and thought I’d try the banana leaves. Well, I got impatient and used parchment baggies instead since I have them and figured they might work just as well. 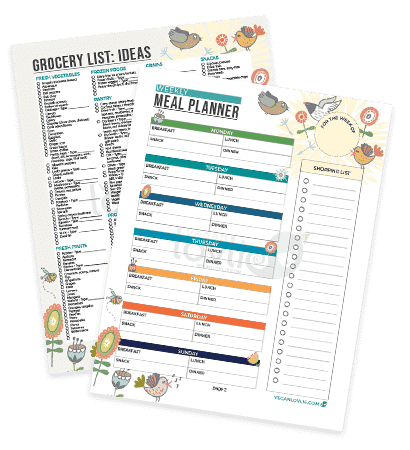 Do you have any experience using parchment paper? I’m just 3 hours in so I’m not sure if it’ll work but why not try? Thanks! Dr Ruby, that sounds like a perfect solution for me! How did it turn out? Thank you very much for your detailed recipe and Youtube video! Many successful batches to be made thanks to you! Hi! Thanks for this wonderful recipe: I just made a batch and I think it’s too dry/crumbly. Is there anyway to make it bind better together, while/after it’s fermenting. My first batch came out too wet so this is why I tried to get it drier and now it’s too dry. Thanks! If you leave it to ferment just a little longer (about 6 – 8 hours), more mould will form. This will help to keep it from crumbling. If the beans are really dry, there is less chance that the tempeh will turn bad even when fermented for a little longer. In fact, it’s better to have the beans a little more dry than too wet. Just keep a close eye on the tempeh when it’s fermenting for a little longer so that it doesn’t go off. I hope this helps. I made my first tempeh, and in spite of the mistakes I made, it worked. It was left in the oven for 24 hours instead of 12, and was at 105 degrees Fahrenheit when I took it out. Still, a few hours later, it was obvious that the tempeh was generating its own heat. Then, it was unseasonably cold here last night, and the temperature dropped to 40 degrees Fahrenheit. My drafty old house let in a lot of the cold; the tempeh log was barely warm this morning. The mold had grown enough that I thought it would still turn out. My guess is that it did not ferment as much as it could have, but it was still quite tasty and very filling. For health reasons, my family needs to make dietary changes, and this will be a good start. Thank you for a potentially life changing recipe! You can sometimes leave the tempeh to ferment for a little longer to get more mould forming. Just check that it doesn’t go bad though. I just made my first tempeh, and I want to thank you for your clear, straightforward, and explanatory tutorial. You had already answered every question that came up! Hi Jess, I haven’t tried it with lemon juice, so I can’t really say. It might be worth trying on a small batch. I sometimes use rice vinegar and it works. Thankyou so much for the inspiration. Since trying to go zero waste this year, I’d given up on eating tempeh as it always seems to come wrapped in several layers of plastic. You have inspired me to try to make my own. I’ve just ordered my starter. I’m lucky enough to have access to package free soya beans, so if I make my own, this should be relatively low in waste. Thank you for you amazing post and informative You Tube video. I’m living in Montreal too, and I was wondering where did you buy your non-GMO soy bean in bulk? I find some at club organic but it’s far from my home. Hello , I was wondering . Before I did 1batch and it ended up not hard enough so this time im gonna leave it for longer time for mould to get bigger. I was wondering. This time im gonna do it from 1200grams of soya beans. I was wondering , does it means that I have to triple amount of vinegar too? Or it is gonna be to acidic ? Let me know about what right amound of vinegar I should use for 1,200grams of soya beans. Many thanks ! Hi, I made this but it took a bit longer for the mold to form (5 days) its quite cold here. Do you think it’s still okay to eat? Five days might be a bit too much. You do need to keep it in a warm place for the first 12 hours. After this, the tempeh will generate its own heat. If there was enough of the starter and the right temperature, the tempeh should be ready within 24 – 36 hours. To be on the safe side, it’s best not to consume it. Try increasing the starter, this might help the mould grow faster. The tempeh took 5 days to work, is it still ok to eat? Five days might be a bit too much. If there was enough of the starter and the right temperature, the tempeh should be ready within 24 – 36 hours. If it doesn’t smell of ammonia and smells fresh after 5 days, it might be okay but I can’t be sure. To be on the safe side, it’s best not to consume it and try again with another batch. Try increasing the starter and see if the mould forms faster. I did mine with black turtle beans with soy starter. I left mine in the oven for too long as I forgot to take them out. Overall it was a bit more than 48 hours and the oven was about 25 on the first day and the second day it was 30c. I didn’t bother carrying on as the mould looked well formed already. Plus the plastic bag showed small signs of condensation, so I wanted to get them out ASAP. I hope it’s ok. It has a yeasty smell but doesn’t smell too bad, I guess if it were bad, I would be able to tell right? I’ll update you if we all go down with food poisoning or not lol! Thanks for a super easy recipe! Hello! I grew my own black soybeans last summer & dried them to use. I was wondering has anyone made tempeh from fresh beans vs.dry? I realize the rehydration step can be skipped, but I was curious if it would work, and if so what amounts of fresh beans, vinegar & starter to use vs. dry, rehydrated beans? 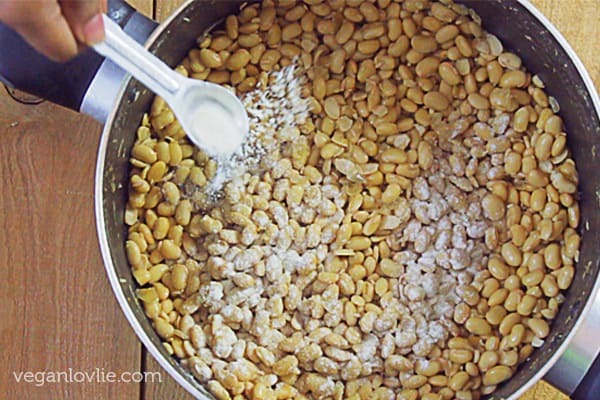 For fresh beans, I would use about the same weight as indicated for the cooked beans in the recipe, i.e. about 900 g. And also the same amount for the rest of the ingredients too. You’d still need to boil/cook the fresh beans as per the recipe. I hope this helps. Hi, thanks for the recipe. I have loved it, but have no tempeh starter. You mentioned it can be shipped internationally. May you give me more information on this. I cannot find it where I am. First time making it and it turned out perfect. I incubated it in the Instant Pot on the yogurt setting. Thanks for the great recipe. Hi! My first go making tempeh! It took a lot longer for the mould to grow properly. Like 4 days – started Sunday night and ate some on Wednesday night and still a little loose/mould not dense like store-bought, so I left overnight and popped in the freezer this morning. My question is, although the outside mould is white, parts of the inside is brown and kind of stringy, specifically around the bean. It seems as though these brown stringy bits formed along the ‘seam’ of the bean/hull. Did I mess this up? I’m not feeling sick today but it did provoke a bit of a revulsion reaction.. It is wonderful to find U in my first search, and You did a great job in offering different container, and processes. 1) what are the temperature for the first 12 hours in your oven with light on That is a Good temperature for this process? 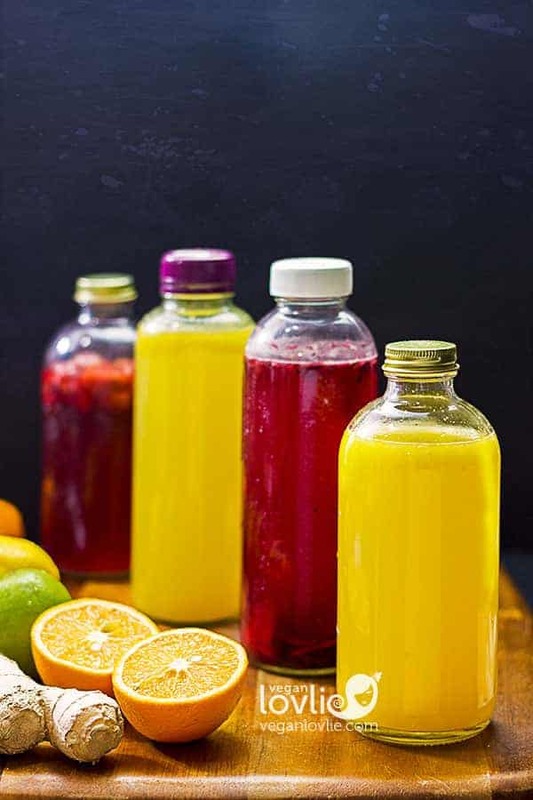 2) what vinegar can be used? could you give us some of them U have used ? 3) could you show a video or a photo if possible , I want to see when U use okara, when it is done fermented, how it is look like? In that way, I would feel safe to know it is safe to eat. thanks so much for your inspiring work for healthy homemade food! I tried two batches of making all successful. I see you waiting for some feedback, here I like to offer what I have read and my experiences. 1) if your oven is between 85-91F, it would be safe for the first 12 hours for starter. After that , the package of bean generates its own heat, so the temperature would need to be lowered, I used a probe stick in the package of bean for tracking so I know better that way. Hope this helps this question. 2) I saw her video and other video, you may use white distilled vinegar or apple cider vinegar ( not raw type. ) hope this also helps U. Best of luck! 1. Around 30 – 35°C is a good temperature to start the fermentation. 2. Like mentioned in the instructions, I use apple cider vinegar. I’ve also used rice vinegar with good results. 3. I don’t have any photos of okara tempeh on hand. Okara tempeh is still on my to-do list for a video or blog post. To give you an idea, okara tempeh is less firm than with whole beans. 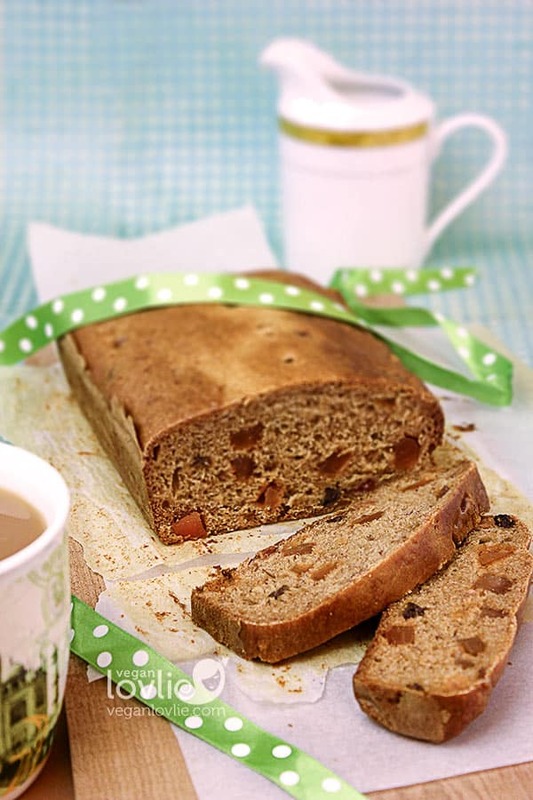 It’s more spongy, somewhat like a dense bread. It is also a little crumbly although this can be reduced depending on the process. I am still perfecting the method for this. So, the tutorial might come at some point in the future once I am happy with the results. I tried the recipe step by step yesterday, put the mix between two wooden cutting boards in the over with the light on for 10 hours. The mixture is still quite free in the bags and not in a “chunk”.Out of then oven, I’ve put both ziplocs in the warmest place of my house, but no white mould appearing. Nothing. :( I wonder if this first attempt is a fail. I am really looking forward to making my own tempeh. I live in Saudi Arabia and it is very difficult to find good vegan protein in the stores. The soy beans are also freaking expensive..
Hi Annie, sorry for my delayed response. I suggest you place it in one of those insulated boxes or just a big box that is lined outside with a blanket to keep some warmth inside. From time to time, open the box for some ventilation. Otherwise if the AC is not lower than 20°C, you could leave it out between two boards and cover them with a kitchen towel. The fermentation will be a little slower at this temperature but if there’s already some mould formation, it should continue to ferment. You can leave it for an extra 6 – 12 hours at this lower temperature. I hope this helps. I hope this note reaches you. For some unknown reason, I have sent an email before to seek an input from you, it did not get posted, maybe lost in the ether. so I would really appreciate this one can reach you if you would let me know. I like to find out that you mentioned that you tried the Soy tempeh without Dehull after soaking? I want to find out, do I need to even try to smash the hull to cause it break? Or just soaking 24 hours would be enough? As I do find dehulling is very time consuming, more than an hour it took. I look forward to hearing from you. Thanks in advance for your answer! Sorry about your previous comment. Sometimes the spam filter thinks it’s spam and puts it in the spam folder. I don’t check the spam folder everyday, so I often miss these comments. I don’t dehull the soy beans. I used to before but I’ve found that the beans still ferment without dehulling and the mould still grows. If you want to dehull all the beans, it is time consuming and will use a lot of water. The difference with dehulled beans, that are broken in half, is that you might get a more compact tempeh. If you have the means to smash the beans before soaking, you may do that. Otherwise, after soaking them overnight, during the rinsing process some of the hulls (maybe about 1/3) will come off, and this seems to be enough. I’ve had many successful tempeh with minimal dehulling. to our Host, thanks so much for your reply, I totally would like to try without dehulling. I do not have a good method of break down the beans, it is all manual labor, with a potato smasher, it takes long time as well. If it does not needed, I can still make tempeh, I would be very happy! I am very grateful fo your input! Many blessings for your support!